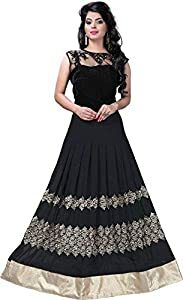 Royal Export brings to you this beautiful dress which is designed for women and is black in color. This gown has been designed keeping in mind the latest trends in contemporary casual fashion. The dress combines ethnic with the fashion of today and makes you stand out among others when you adorn it. The dress features a beautiful flair and has intricate detailing across the flair which gives the dress a beautiful look. This enhances the overall look of the gown and gives it an elegant look. Pair this dress with a pair of stylish heels and a matching clutch for a complete casual look for a casual event, a party or an evening with friends.